Saturday 4th of June was the date of the night paddle, the problem was that John and I had just finished a full day of coaching screaming Brownies and leaders on open boat rafts. With an hours power knap, Andie arrives for a lift to Bradwell. Once ready, Andy E, Andie B, John H and I get on the water at 21:50 at Bradwell on the rising tide. I’ve never seen the Blackwater Estuary so glass like and flat. It was a spring tide and before we knew it we had passed Osea island and were approaching Heybridge basin (00:00). After packing Andie (half-a-trip) B off, we had a two hour cuppa and a snack at the Basin. 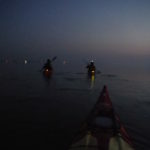 02:00 proper dark now, down to three paddlers, we were back on the water heading to Bradwell. At around 02:30 it started to get lighter with the power station as a great way point in the distance to spur us on. With it almost full day light now we got to the public slip way Bradwell at 03:45 frazzeled but smiling. 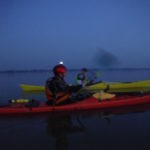 This was a great night paddle exercise, yes a bit mad too but you never know when for one reason or another you’ll have to paddle in the DARK! 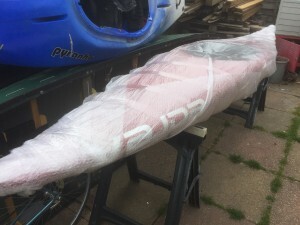 Thanks to Clive for picking up the new club slalom boat. It’ll be at the pool on Monday.